The elder brother of the Google Pixel 2 comes with a larger and brighter display with an improved battery life. The Google Pixel 2 XL comes with an exceptionally powerful processor, a superb camera, and vivid display. We recommend the Google Pixel 2 XL over the Google Pixel 2 if you prefer a larger display but there is nothing much else that separates the two smartphones from Google. The Lowest price of Google Pixel 2 XL in Pakistan is Rs. 134,999, and estimated average price is Rs. 134,999. The Google Pixel 2 XL is the big brother of the Google Pixel 2. The Google Pixel 2 sports a large and beautiful display with a powerful processor and an incredible camera which is arguably one of the best smartphone cameras out there. The Google Pixel 2 comes with stock Android which brings out the full potential of the operating system. Google has put a P-OLED screen in the Pixel 2 XL rather than the AMOLED which was found on the Pixel 2. The display size and resolution are higher too with the Google Pixel 2 XL sporting a QHD display adequate for watching HD movies and playing high-resolution games. There is a 100% DCI-P3 coverage and Always-on display on the Google Pixel 2 XL as well. 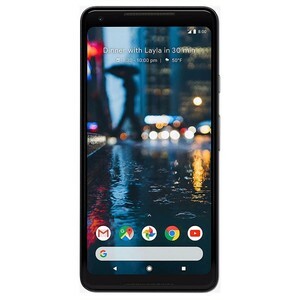 The design of the Google Pixel 2 XL is slightly different than that of the Google Pixel 2 with the back camera on the left on the flash rather than the other way around and thin bezels on the front. Though the speaker is on the front with the Google Pixel 2 as well, the screen-to-body ratio is much higher and overall, the smartphone looks attractive from a distance. The front glass and partial back glass are protected with Corning’s Gorilla Glass 5 while the body is made up of aluminum. There is a rear-mounted fingerprint scanner on the smartphone. Overall, the build quality is solid and the Pixel 2 XL sports an appealing design. The Google Pixel 2 XL comes with the Qualcomm Snapdragon 835, an octa-core processor, and an Adreno 540 GPU. The Pixel 2 offers great performance and the optimized stock Android version guarantees a lag-free experience. The benchmark scores for the Google Pixel 2 XL are 3379, 39143, and 170407 in Basemark OS II 2.0, Basemark X, and AnTuTu 6 which are slightly higher than that of the Pixel 2. The standout feature of the Google Pixel 2 XL is its 12.2MP + 8 MP camera setup. The back camera comes with dual-pixel autofocus and it is a beast in both good lighting and low lighting conditions. The image quality is very impressive with photos coming out to be sharp, detailed, and fine-tuned. All photos look natural and the color reproduction is simply amazing. The HDR+ feature ensures that the Google Pixel 2 XL has a wide dynamic range too. As for the front shooter, it can produce detailed portraits that are sharp and accurate. You can even blur out certain or all parts of the background with the front camera on the Google Pixel 2. The Google Pixel 2 comes with a 3520 mAh battery that has an endurance rating of 88 hours. The smartphone’s battery life is impressive and it can easily give you 24 hours of battery with heavy use including data connectivity. There is fast charging support too which can take your phone from 0 to 100% in just 1.5 hours. 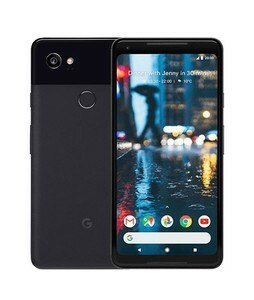 Google has all ends covered for connectivity with the Google Pixel 2 XL with Bluetooth 5.0, NFC< and a USB 3.0 Type-C connector. Sadly though, there is no 3.5 mm audio jack so you will have to make do with the Type-C to 3.5 mm adapter that is included with the Pixel 2 XL. Stock Android – minimal bloatware and no custom skins on top. Brilliant camera which is one of the best smartphone cameras around. Expensive when compared to other flagships.